Reverend Erik Swanson is a spiritual director, speaker and retreat leader who teaches at several prominent seminaries on spiritual formation and the art of bringing an awareness of the Holy to all parts of life. 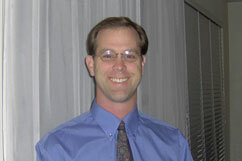 A graduate of San Francisco Theological Seminary, he is currently pastor of Westhope Presbyterian Church in Saratoga. He is a co-founder of the Minnesota Institute of Contemplation and Healing and has spent a year living in and studying sacred community in the ecumenical TAIZE monastery in Taize, France.